At the Prime Minister’s Office on June 12, Governor Nakaima submitted a request to Prime Minister Shinzo Abe to provide more detail about the plan to return U.S. bases and land south of Kadena Air Base. Governor Nakaima again asked the Prime Minister to cancel the deployment of the MV-22 Osprey aircraft, saying, “Our concerns over the aircraft’s safety have not been resolved.” The Prime Minister said, “It will operate based on the agreement of the Japan-U.S. Joint Committee to protect residents’ safety.” He did not comment on the plan to move Osprey-related training from Okinawa to other prefectures. Nago Mayor Susumu Inamine told the Prime Minister that the consolidation plan for U.S. bases, which is basically a package proposal including the relocation of the Futenma base within Okinawa, will not move ahead. 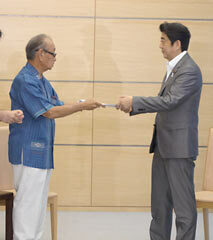 Cabinet Secretary Yoshihide Suga attended the meeting. Governor Nakaima and the mayors made the same request to Foreign Minister Fumio Kishida and Minister of State for Okinawa Ichita Yamamoto.